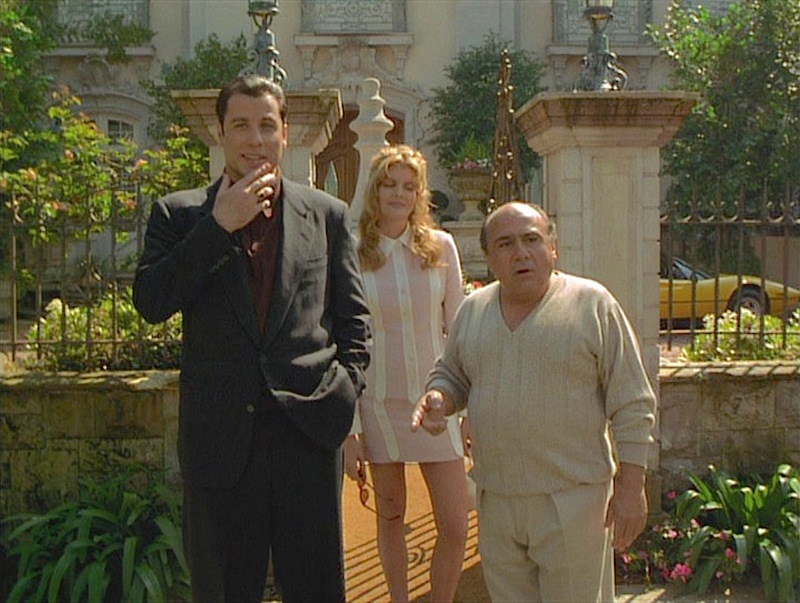 Of course, in the L.A. of Get Shorty, the sun is brightly shining on Chili Palmer and his new acquaintances in the film industry as he takes a meeting with the eccentric pint-sized superstar Martin Weir (Danny DeVito), supposedly based on Dustin Hoffman after Elmore Leonard’s experiences working with him in the ’80s. 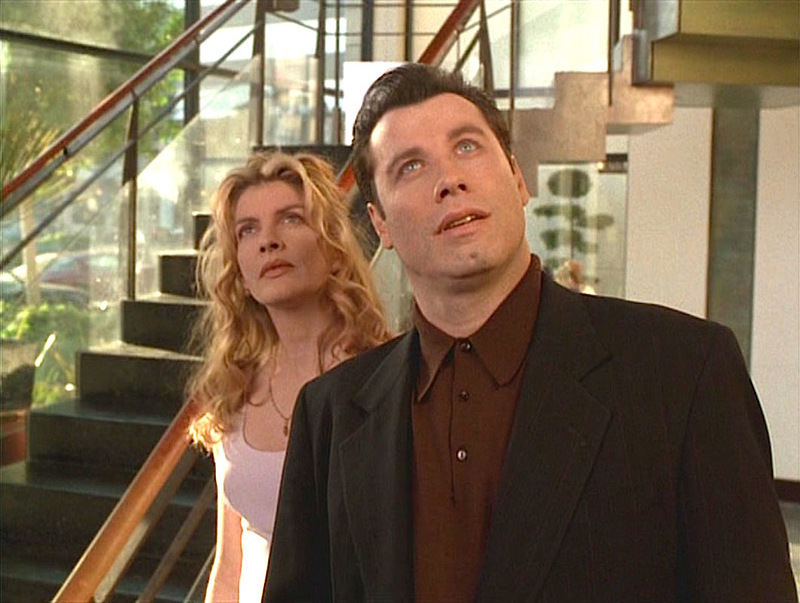 I’ve received several requests to write about John Travolta’s style as Get Shorty‘s slick loan shark-turned-movie producer. Chili Palmer is hardly a vibrant dresser; he uses a limited palette of strong, dark colors to create a smooth look that simultaneously evokes sophistication and danger. 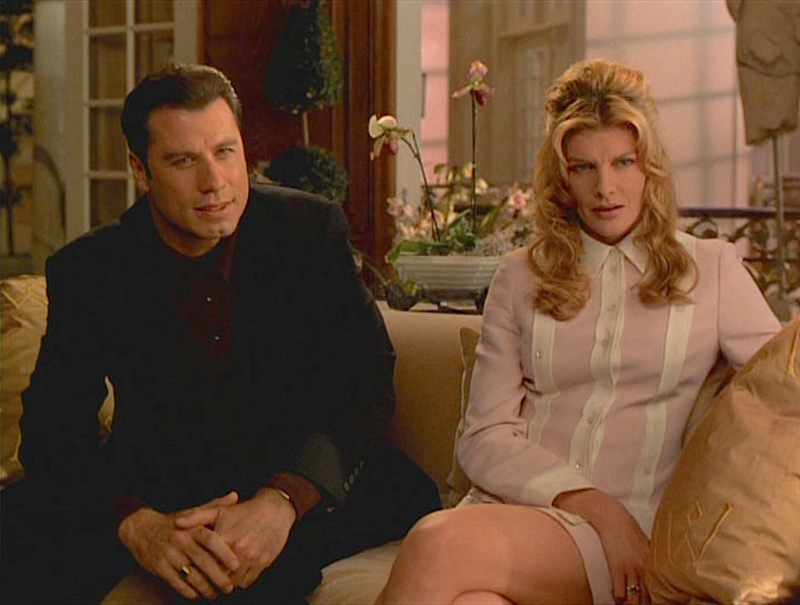 In addition to his plot-propelling leather jacket, Chili brings three suits with him to the West Coast: a taupe silk suit from which he wears the orphaned jacket, a solid black suit that gets the most wear out of, and this subtly striped black suit that he wears only with a rust-colored polo shirt that coordinates with the russet tones of the stripes in the suiting. 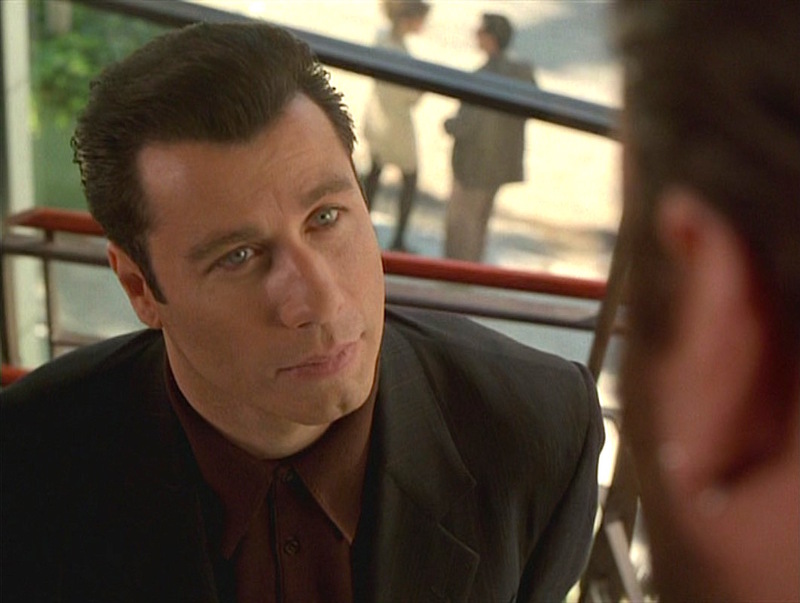 Chili encounters Bear (James Gandolfini), Bo Catlett’s right-hand man. Notice the very subtly striped suiting, differentiating it from Chili’s usual solid black suit. Certainly a man who cares about style, Chili’s suits are styled in the fashion of the 1990s without giving too much to the era’s trends (think Chandler Bing’s boxy three-button suits). 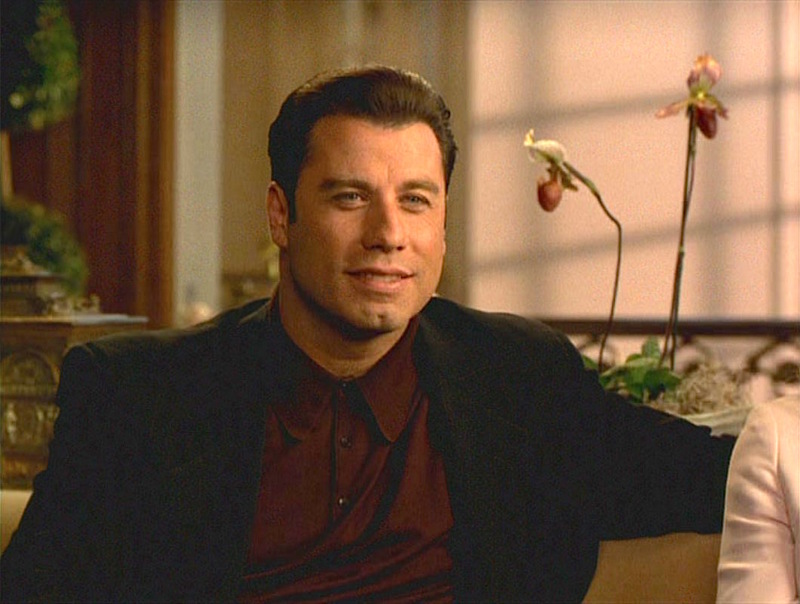 At 6’2″, John Travolta is the kind of guy who could have gotten away with the three-button suit jacket fad of the ’90s, but Chili’s single-breasted jacket is more inspired by timeless trends with its (albeit low) two-button front. Additional concessions to the decade are the padded shoulders and ventless back. The jacket also has a welted breast pocket, straight jetted hip pockets, and four-button cuffs. Chili demonstrates the wonders of the 1994 Oldsmobile Silhouette for an astonished Martin Weir. 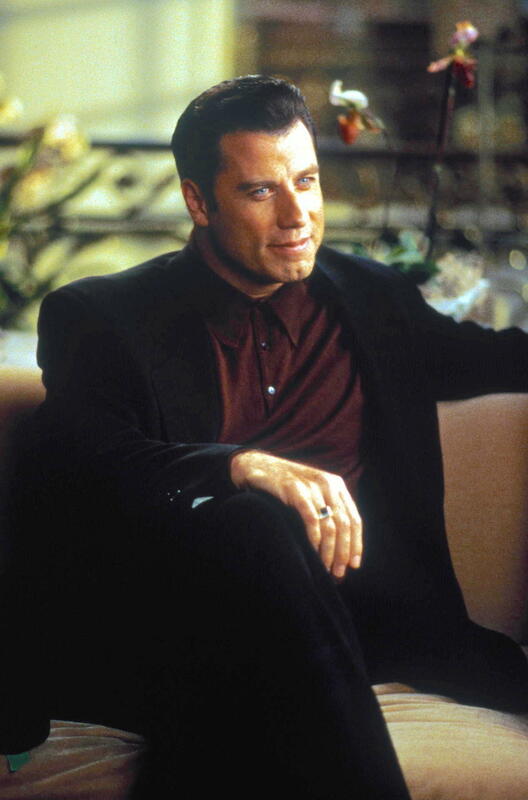 Unlike his literary counterpart in Elmore Leonard’s 1990 novel, Travolta’s on-screen Chili eschews dress shirts, instead exclusively wearing long-sleeve soft knit polo shirts in dark, solid colors. With this suit, he calls out the subtle striping with a rust-colored silk polo shirt, worn buttoned to the neck as usual. Karen Flores (Rene Russo) accompanies Chili on his adventurous day of meetings. The soft silk shirt has a large self-collar with gently rounded points and pick stitching visible along the edges. He wears it with all three of the rust-colored recessed plastic sew-through buttons closed up to the neck. Chili listens attentively as Martin Weir regales him with film industry lore. Chili wears his shirt untucked, covering his waistband, but his trousers likely have belt loops and would be worn with a black leather belt, similar to this one from the production featured on Prop Bay with its ridged gold-toned single-prong buckle. The flat front trousers have side pockets where Chili frequently slips his hands and plain-hemmed bottoms. 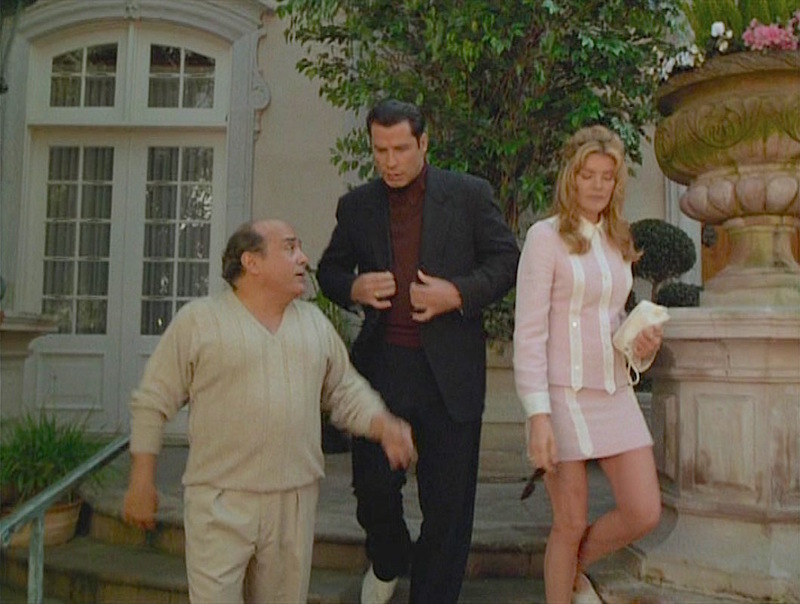 A blink-if-you-miss-it continuity error: Chili’s usual black alligator loafers are replaced by these noticeably different off-white shoes in this full shot of Martin, Chili, and Karen leaving the Weir mansion. It would be hard for a guy like Chili Palmer to have street cred with the mob if he didn’t own at least one pair of gator-skin footwear. Chili sports a pair of black alligator loafers throughout Get Shorty, worn with a pair of black ribbed socks that continue the leg lines of his invariably black trousers into his shoes. Chili on set, prominently sporting his black alligator loafers. Chili doubles down on his mob street cred factor by sporting all gold jewelry, albeit more subtly than some. His thin gold watch has a rectangular case and is strapped to his left wrist on a flat gold bracelet. On his right hand, Chili wears a gold ring with a large green square stone. The closest approximation to this outfit in the source novel would likely be when Leonard describes Palmer’s muted dark blue pinstripe suit, worn with a rust-colored tie and a tab-collared blue shirt. Here, we indeed have a muted dark striped suit but the rust coloration is spread from the tie into a more casual shirt. Saunter into the first weekend of the holiday month by subtly incorporating some color into your wardrobe à la Chili Palmer in Get Shorty. Buy the movie. 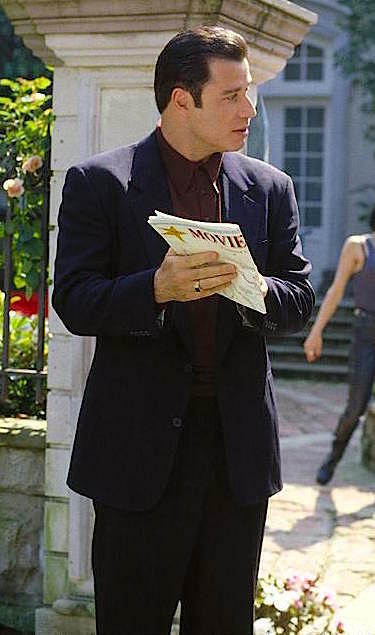 It even had the rare approval of Elmore Leonard himself – as reported in the Los Angeles Times in 1995 – and is still considered among the best adaptations of his work. And speaking of his work… you should definitely grab Leonard’s novel while you’re at it! Rough business, this movie business. I’m gonna have to go back to loan sharking just to take a rest.